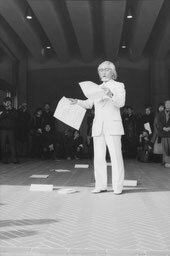 World Uprising is a continuation of the project Yutaka Matsuzawa started in 1971.
but I think the idea that a piece of paper (with pictures, words) sent by post can be an art work can co-exist with internet. This exhibition is a prologue of a new World Uprising. Please send a work related the idea of 'mail art', 'world uprising' and 'Yutaka Matsuzawa's philosophy'. We are making a pamphlet by the end of this month with artists names. World Uprising’ was a mail art project initiated by Yutaka Matsuzawa in 1971,72 and 73. 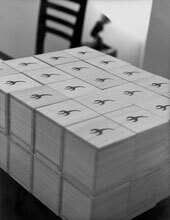 Each year, 99 or 108 artists all over the world were asked to participate in this project by mailing something. The mailed items were to be exhibited, but as the act of mailing itself was considered to be art, the exhibition, including the slogan to go to Louvre, was not important. We now announce the 4th phase of ‘World Uprising’ in 2014. If you share the same interest and are willing to send your work, please do so within the size of 30 x 30 cm. We will not return the works, but will archive them at Bigakko, and hope to have the final exhibition at British Museum in 2222. ●World Uprising - Selected mail art works from the first to third uprisings, plus works of the 4th Uprising. How to preserve and reconstruct the Psy room in its original form.